The rose bush is a perennial shrub that blooms in late summer. It has fragrant flowers that come in a wide variety of colors such as pink, white, red and yellow. Roses prefer full to partial sun and well-drained soils. 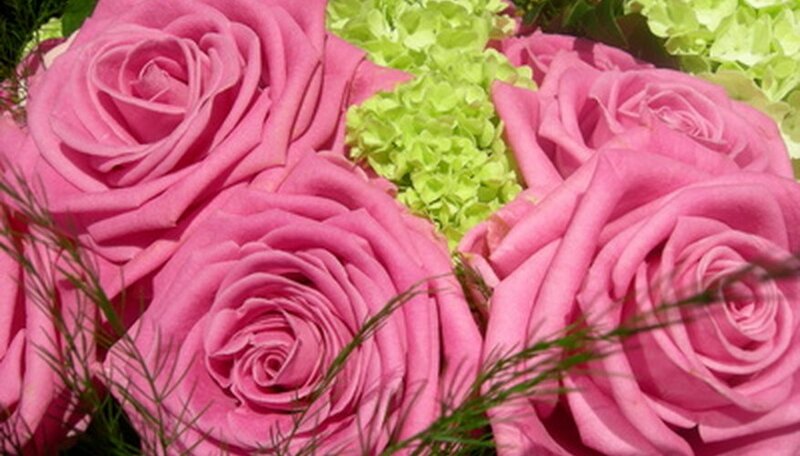 Roses make attractive additions to any garden, complementing other flowers with their blooms. Delphinium is a flowering perennial that is a member of the buttercup family. It can grow nearly 7 feet tall and blooms from late spring to late summer. The flowers grow in clusters along a tall stem and range in color from purple, blue and yellow to red and white. The plant is more common in the higher elevations of mountains and prefers full to partial sun and moist soils. The blue delphiniums complement roses well. Daylillies are flowering perennials that are native to Europe, China, Korea and Japan. Most daylily flowers open up at the first sign of daylight and close when the sun goes down. They bloom in late summer and can flower in peach, yellow, orange and red. Daylilies typically grow up to 3 feet tall and prefer full sun and well-drained soils. Daylilies work with roses by providing color towards the base of the garden, below the roses. The clematis is a flowering perennial that is a member of the buttercup family. Clematis range in color from purple to white and yellow and bloom in late spring. The woody, climbing vine can reach up to 8 feet in length and needs support when it is growing. This vine requires at least six hours of sun per day and prefers a rich, well-drained soil. The needs of roses and clematis are similar, making them good companions. Allow the two flowers to grow together on a trellis for spectacular color. Lupine is a perennial flower that usually grows 1 to 5 feet tall, though shrubs grow as high as 10 feet. It is a cool season flower which blooms in late spring to early summer, providing a food source for grazing animals. Lupine's colorful flowers can be purple, red, pink or blue. It has similar needs as roses, which make it an excellent choice as a companion plant.